Last week, my oldest son (who is 8 years old) told me he was really interested in whales. He’s been learning about them in school, and once something piques his interest there is no stopping him in his quest for knowledge about that topic. He just drinks it up like a thirsty camel. I told him that there is an entire film devoted to humpback whales, and he was beside himself with joy. I was of course referring to Star Trek IV: The Voyage Home. I cracked open my entire Star Trek film library and showed him the discs of the original six films, along with the four Next Generation films and Star Trek (2009). I don’t have the two most recent films because I haven’t been in a movie-buying mood for the past few years unless it’s something really special. Two of my younger kids caught wind of their older brother’s plan to watch Star Trek IV, and they wanted to join in on the fun. They love doing just about everything together, so I wasn’t about to try to keep them apart. The more the merrier. I enjoy sharing the things I love with the people I love. So we all sat down on Friday night and watched the film together. Here are some of my observations about how my kids reacted to what they were watching. I tickled their brains when I noted that the Enterprise crew finds a way to get the whales aboard their spaceship without actually flying into the water to get them. They wanted to know how the crew manages that fantastic feat, but I told them they had to wait and see for themselves. It was worth the wait. My 7-year-old daughter asked if the film was going to be scary, and I told her that it is actually lighthearted and funny. Nothing scary happens in the film, unlike most of the other films in the series. I’ll have to ease her into the other entries. They were particularly interested in Spock’s metamorphosis in the film. I had already told them that he dies in Star Trek II and is resurrected in Star Trek III, so they were primed to see him get his memories back in this film. He was one of the highlights of the film for them. Despite his unchanging facial expression throughout the film, he really captured my kids’ attention and made them care about his emotional journey. They quickly tired of the opening credits. I eventually relented and fast forwarded through them. My kids don’t seem to appreciate music’s subtle ability to set the mood. They described it as just a big line of words. My daughter really wanted to see what the aliens in the probe look like. She was disappointed when I told her that we never see the aliens, but I assured her that they probably look a lot like the whales themselves. That placated her somewhat. They were confused by the transitions in the first few minutes. We go from outer space to Earth to Vulcan really fast. There are establishing shots, but no text to tell us where we are. Having seen the previous films, as a kid I picked up on the visual clues of where we were in each scene, but my kids have not seen them yet, so they were a little lost. They didn’t understand what was happening when Uhura was modulating the probe’s transmissions to see what they would sound like underwater. I had to explain that part quite a bit. Right after the Enterprise crew goes back in time, my 5-year-old son told me that this movie is boring and it isn’t funny like I promised it would be. I laughed and told him to be patient because the jokes were coming. Nearly every joke in the film went over my kids’ head. They thought it was weird that the crew just walks in front of traffic when they first arrive in 1986 San Francisco, and they didn’t understand why the police officer just stares at Chekov when he asks for directions to the naval base with “nuclear wessels.” It’s interesting to try to explain Cold War tensions to my kids because it’s such a foreign concept to them. They laughed when the Plexicorp president yells, “Not now, Madeline!” at his assistant, so at least they got a tiny bit of comedy out of the film. They were just as mystified as Kirk and Spock when Gillian says she has a tire iron right where she can get at it. They were mostly just curious about the film. They wanted to know what Spock did to the man with the loud radio to make him fall asleep. They wanted to know why Spock was swimming with the whales and when he had jumped into the tank. It was mostly just question after question from them. I enjoyed answering their questions and helping them understand the film, but it’s not the same as being able to understand the events for themselves. I was worried about the foul language in this film. But I’ve watched enough ‘80s movies with my kids and I’ve talked with them about the use of swear words to the point that they seem to understand what I expect of them, and nothing in the film fazed them. They were on the edge of their seat during the scene where the whaling ship is zeroing in on the two whales. My oldest son knows a lot about whales, and so he knew that they can’t stay underwater indefinitely. They need to come up for air, and when they did that they would be sitting ducks for the harpoon. It was satisfying to see their relieved reactions when the harpoon hits the cloaked Bird of Prey and falls straight down into the ocean. They got fixated on the idea that Gracie the whale is pregnant, and they wanted to know what would happen to the baby. We never actually see the calf during the film proper, but we do see a single whale swimming all by itself for a few seconds during the end credits. 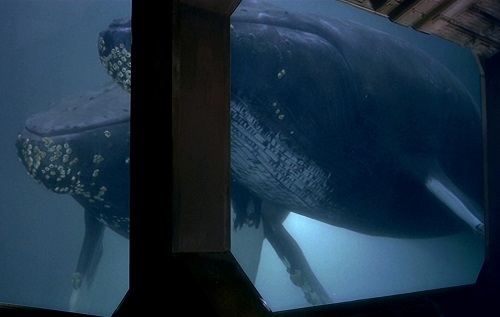 For most of the film we see the two whales together in the same shot, so I seized upon that moment when we just see one whale to tell my kids that that is George and Gracie’s baby. That gave them a sense of closure. My kids stuck through it to the end and we all had a fun time. Even though they didn’t understand most of the jokes, my kids still told me that they thought the film was funny. If you’ve got kids, I highly recommend sharing with them the films you grew up loving because doing so might just help you relive what made you fall in love with them in the first place and also give you some new insights into them that you hadn’t considered before. Think of it as a voyage home. This entry was posted in Random Stuff and tagged 1980s, animals, childhood, comedy, family, films, funny, humor, movie review, movies, personal, science fiction, sequels, spock, star trek, time travel, whales. Bookmark the permalink. Sometimes I think that sharing movies with my kids was my only parenting skill. Even that was off the beam sometimes. Sometimes it was too early for certain titles. Nonetheless, overall it worked out pretty well. When my daughter and I attend screenings of the Star Trek reboot films she was at first taken aback at all the audience members that were my advanced age. “Where do you think Trekkies come from?” I asked. She was quiet.